I was in the greater DC area for a few nights a couple weeks ago. Based on wild hotel prices, I decided to stay at the Westin, in Alexandria. There really wasn’t a whole lot of options in the area for food (within walking distance). The first night in town, I decided to eat at the restaurant in the hotel, the Jamieson Grille. I arrived late in the evening, around 21h30 and the restaurant was almost empty. I checked the menu and found a couple of options that looked good. I asked my server which of the three items I was interested in was the best. Which three items? Grilled Pork Chop, Grilled Ribeye Steak or Pan Seared Breast of Chicken. Without missing a beat the waiter suggested the pork chop. 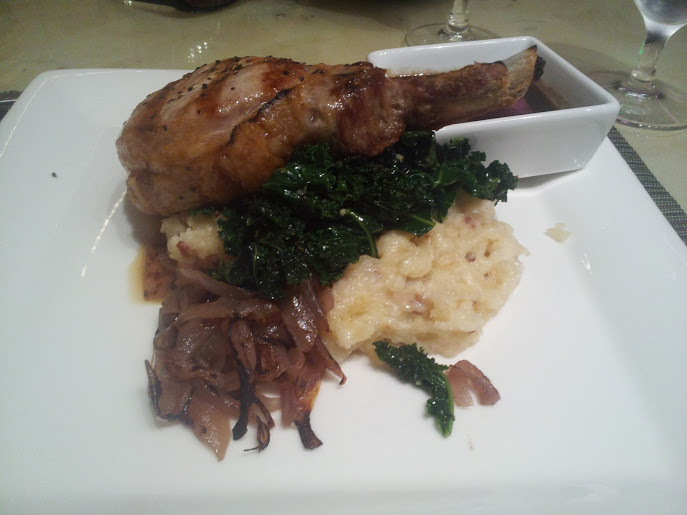 Thankfully this pork chop was served with a jus – otherwise it would have been as flavorless as eating a piece of paper. The mashed potatoes were very good, but then again what isn’t great with gouda and bacon? The pork was pretty tough too. I’m still working to get my strength back in my right hand following my accident and I had a difficult time cutting this pork chop. The server was very good. He always made sure I had everything I needed. I didn’t tell him the chop was flavorless and tough. He really did provide excellent service. Would I return to Jamieson Grille? Only if I had to. If I arrived late at the hotel and didn’t want to leave, of course I would visit again. Would I recommend the pork chop? In a vacuum, no, I wouldn’t. Since the server was very quick to recommend, I wonder if this really was the best of the options I gave him — what do the other items taste like? Have you been to Jamieson Grille before? What is your favorite menu item here? When staying in Alexandria, where do you eat? By Tim in Food, Travel on July 16, 2012 .